As a baseball fan I suppose it was natural that I would eventually try to tie my "Generations" view of History to baseball's great eras. The tables below are my latest effort. In these tables I have gathered the greatest baseball players, by birthdate only, into the generational fold. I think this compilation is a good self test for generational identity. Look through these generational teams and decide which one you emotionally associate with. I am willing to bet you will find that it is the team from your very own generation. Keep returning because I am going to keep working on this page until I get it right. Anyway, I hope you have as much fun with this as I am having. They say the ball became live when they went to the cork center in 1911. It certainly seems like that was the case. But something else happened about then. The Lost Generation took the field. Babe Ruth and his contemporaries made baseball into a hitters game. But it didn't stay that way. Over the years the hitting waxed and waned, even with the cork center. Until just recently. In the last few years hitting has taken back its place in baseball's itinerary. In fact, it kind of coincided with the arrival of the Generation-X crowd. The first Reactive Generation to come to bat since, you guessed it, the Lost Generation. Go figure. The Gen-Xers have already claimed the Home Run as their own and they are only halfway through their run. Another interesting point is that, right at this moment in time, essentially the entire professional league is made up of Generation X players. In the following tables I have attempted to designate a top generational team for each of the generations in modern baseball history as well as honorably mention a few others for their accomplishments. Initially I tried to extract this information from the player statistics directly but my statistical expertise and my patience were both found wanting and I have finally decided to revert to a less rigorous but more satisfying method. I have used Bill James' wonderful book "The New Bill James Historical Baseball Abstract" and sorted his top player lists to reveal top players in each generation. Keeping in mind that the rankings are a few years out of date (which would mainly effect the active players), I still think the resulting "All Generation" team listings are a great tribute to the stars of baseball, past and present. Enjoy. The history of modern baseball stretches back into the mists of the 19th Century. Alexander Cartwright is the accepted inventor of the modern game, introducing a set of rules for a baseball game, in New York, in 1845. In the years that followed, baseball became more popular, the rules and playing styles changed and the game matured. The 1860's, of course, were defined by the terrible reality of the Civil War and baseball, along with most aspects of social life in the United States, were put aside. Finally, in 1869 when the first professional teams began to form, useful statistics were kept for the first time and a reliable history of the game began to be recorded. After 1871, when most of the statistics that have been handed down began to be collected, it finally became possible to compare individual player's performance. The Gilded Generation were the Civil War generation. The youngest of this generation were 18 years old when the Civil War began. Early on, most all of the fighting soldiers in the Civil War were of this generation with the early members of the Progressive Generation joining them as the war wore on. By 1871, the youngest of this generation were already nearly 30 years old. Their baseball careers were already waning as baseball emerged from the fog of time. Because there is so little information about this generation, I will not try to build a generational profile for them but it is important to remember how important their contributions were to the invention of the game as we know it. Joe Start, for instance, is credited with the 1st baseman's strategy of holding the runner and playing off the bag otherwise and Dickey Pearce is credited with inventing the bunt. I would like to specifically point out one member of this generation. Joe Start was born in the last year of the Gilded Generation. 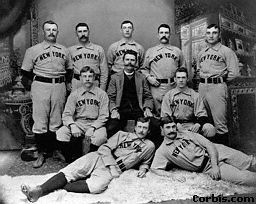 Born even before Alexander Cartwright offered the rules of the game, he ended up with a 27 year long baseball career that began before the Civil War and stretched all the way to 1886, when he finally retired at the age of 44. No slouch, he actually had the most hits for the 1878 season when he was 36 years old. He was the oldest player in the league, and probably the last of his generation actively playing, from 1879-1886. Joe Start truly bridged the gap between baseball mythology and modern professional baseball. Dominant Years (1890-1912) "Dead Ball Era"
Playing Years (1900-1944) Hitter's "Live Ball Era"
Playing Years (1918-1968) "Era of Transitions"
Playing Years (1942-1984) "League Growth Era"
Playing Years (1960-2004) "Free Agent Era"
Playing Years (1978-2025) "Steroid Era"
Playing Years (1999-2045) "The Next Era"
The Millennials are just beginning to reach playing age. I would be willing to bet we will see some future stars showing up on the radar pretty soon. Bold denotes the all generational team. Clearly, in some cases, the players were not actual playing contemporaries. If a player happened to be an early cohort in his generation then he would have to play late into his career to play with the last cohorts in his generation. Don't be disappointed if your favorite active player doesn't show up on the list. The Gen-Xers are only halfway through their playing years and some of the stars haven't built up their stats to the level that will get them on later lists. In several cases players have been included only on the basis of their having been voted into the Hall of Fame. I know there is controversy surrounding some of the these selections but I feel that if they have been picked by a group of knowledgable voters they probably were outstanding players and should be recognized for having been selected. In each of these cases they appear as backups for their position with an asterisk by their name. General Notes: The records are all-time baseball records. Dominant Years are the years when most of the top players in the league are from the generation. If you want to talk about Baseball History or about Baseball and History in general drop by my BLOG. I would love to hear from you.